"Surprisingly easy and extremely flavorful. The curry powder does not add an actual curry taste, just a nice rich flavor, so give it a try even if you aren't a curry fan." Bring chicken broth to boil in a saucepan over medium-high heat; continue simmering while preparing remaining ingredients. Heat olive oil in a large skillet over medium heat. Cook and stir celery, onion, green onion white portions, garlic, curry powder, and salt in the hot oil until vegetables are tender, about 5 minutes. Transfer vegetables to a bowl. Cook and stir rice in the same skillet until lightly toasted, about 3 minutes. Stir toasted rice into boiling chicken broth. Reduce heat to medium-low; continue simmering until rice is tender and broth is absorbed, about 15 minutes. Remove rice from heat and stir in raisins, green onion tops, and celery mixture until well blended. 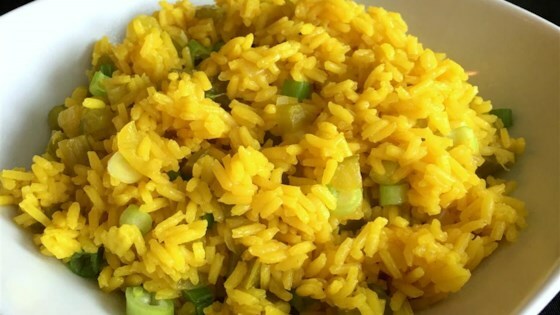 Chef John's savory rice is the perfect complement to spicy meat dishes. Family just loved this one. Made no changes. Delicious! used the oven method and it turned out perfect. I want to experiment with saffron, slivered toasted almonds and a few more veggies next time. Definitely a keeper! Very similar to a version my Kurdish friends make. Delicious. Great recipe. Lots of potential for variations.